Taipei is the capital of Taiwan and a popular tourist destination in the area. It is the island's financial, cultural, and governmental center and it has many amenities and facilities available for visitors. If you're traveling alone, there are plenty of fun hostels that you can choose from where you'll likely make some friends and have a great time. The city is popular with all types of travelers, including study abroad students, backpackers, and families, so you'll likely meet a diverse group of people. How much do hostels in Taipei cost? 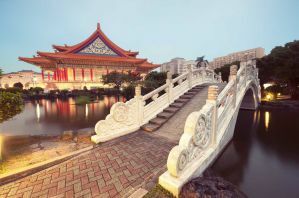 Meander Taipei is a great option for solo and independent travelers. They regularly organize events for their guests, and there are regular tours of the city. You can enjoy the hostel's daily cycling tour which goes by many off the beaten path sights around the city. This hostel is a wonderful option if you want to meet other guests and make some new friends. The hostel is located in Ximending, which is a convenient location and popular area for travelers. The area has many different shops, cafes, restaurants, and entertainment options. There is karaoke and various theaters nearby as well. It's a seven minute walk from Ximen Metro exit 6 and there are many conveniences nearby including banks and markets. If you're traveling alone and want some ready made friends to explore the city with, then this is the place to stay. There always seems to be something going on and the staff is friendly and fun. Many members of the staff are travelers themselves. Eight Elephants & Dreaming Dragon is a warm and welcoming place to stay. The atmosphere is friendly and independent travelers find it easy to make friends. Some people stay for only a few days, while others base themselves here for a few weeks while they study or simply enjoy the city. This hostel will quickly become your home away from home, and the staff and other guests will soon become family. The staff is a mix of travelers, students, and locals. It's a great place to stay if you want to meet an eclectic and diverse mix of people from both nearby and far away. The hostel is located in Shida Area and is a three minute walk from Guting MRT Station. It's near restaurants, supermarkets, and convenience stores. It's also about a ten minute walk from Shida Night Market, MTC, NTNU, and Riverside Park. This is a fun place to stay if you're traveling alone and want to make some new friends. It's a favorite among travelers to Taipei. JV's Hostel is a popular option for study abroad students who need a place to stay. The hostel is located next to Taipei 101 and is surrounded by the largest night market in the city. There are many popular bars and clubs nearby and it is close to public transportation with metro and bus stops both near by. The hostel is close to both the red and brown lines on the metro, so it's easy to access many places around town. There are many amenities available to guests including free wireless internet, laundry facilities, free luggage storage, air conditioning, all kinds of travel information, and access to a refriderator, freezer, and microwave. Both private and dorm rooms are available and you can choose between mixed and female only dorms. The guests and staff are very diverse and international, so if you hope to make an interesting group of friends, then this is a great place to stay. Flip Flop Hostel is conveniently located near the Taipei Main Station. This provides access to pretty much any other place on the island. All forms of public transportation are easily accessible from the hostel and it's the perfect base for exploring the area. The hostel also has a unique atmosphere. It was designed with the help of a local artist and it has a cozy vibe. There are a variety of amenities available to guests including free wireless internet access, travel information, free storage, laundry facilities, and even a public kitchen area. Guests can choose between single rooms and dorms. There is also a female only floor. Every bed has it's own lamp and is arranged for as much privacy as possible. The hostel is surrounded by restaurants, theaters, cafes, and plenty of entertainment. This is a great location and a great environment for solo and independent travelers.